Firstly let’s understand what Veneers are. Veneers are thin sheets of wood sliced from logs of wood obtained from trees. 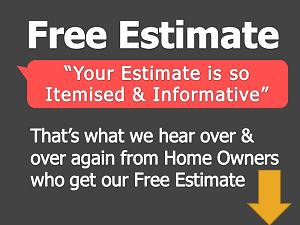 Well, there are different ways veneer are cut to obtain veneer sheets. The 2 main methods of cutting veneer are Rotary cuts and Slicing or Flat cut. Rotary cut veneers are manufactured by progressing a rotating log against a vertical steady knife or blade. Rotary cut veneers patterns are usually wide, bold grain and random for the way it is cut i.e. along the growth rings of the log. Rotary cut is one the cost effective method to obtain veneers. Mostly softwood veneers from maple and oak trees are cut this way. It’s only with rotary cut that whole piece faces are available. Sliced Veneers are cut along the width in different ways- Flat cut, Half-Round cut, Quarter cut and Rift cut. 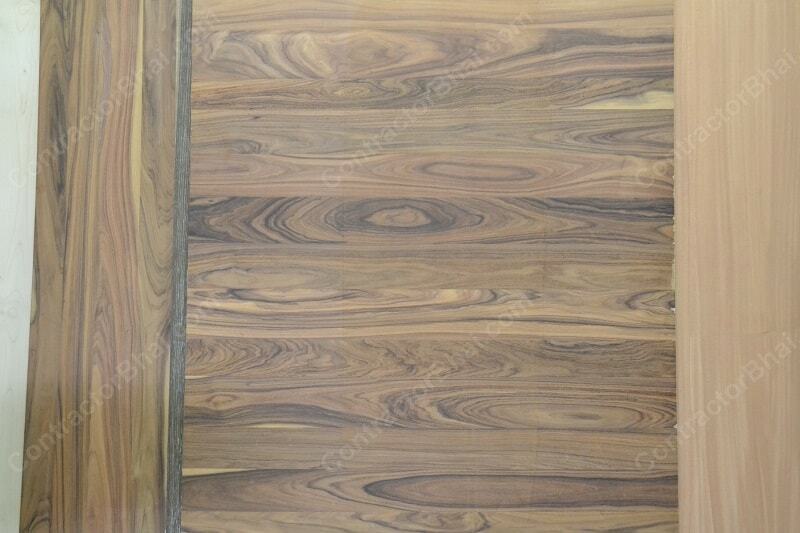 • Flat Cut veneer also called as Plain Sliced or Crown cut are widely used veneers. Flat cut veneers are obtained by progressing a half cut log against a steady knife moving in up-down movement. Veneer cut in this style is categorized by the straight grains mixed with cathedrals. 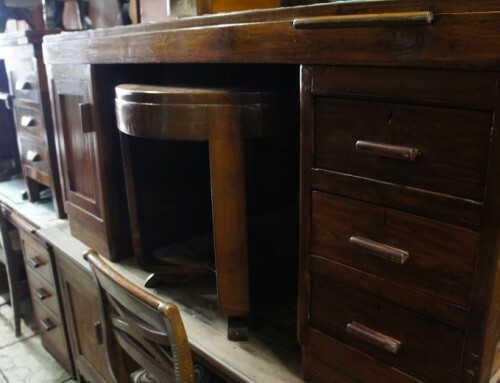 Flat cut method is reasonably priced and is available for most wood kinds. 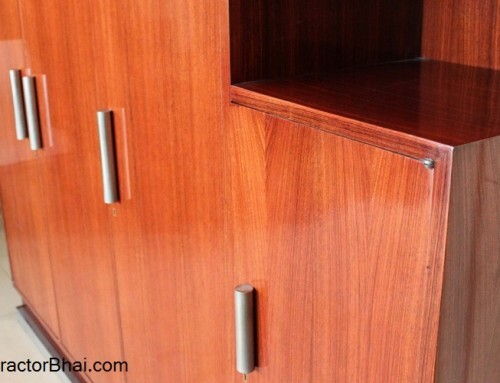 Flat cut veneers are ideally used for wall panels and furniture because of the uniformity in grains. • One can say that Half Round cut is a variation of rotary cut. Here the flitches of log are placed off center on saw which results in a diagonal cut across growth rigs of the log. It therefore appears to be modified version of rotary cut and flat cut veneers. 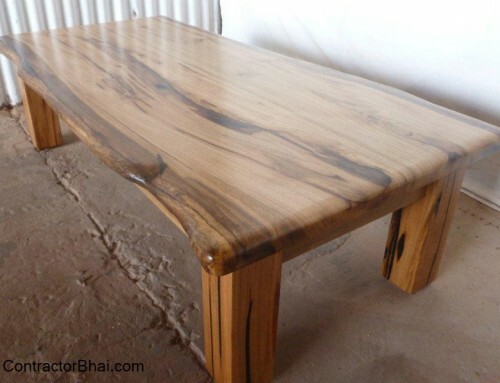 This cut is mainly used to highlight the grains especially of burl’s and maple tree wood. 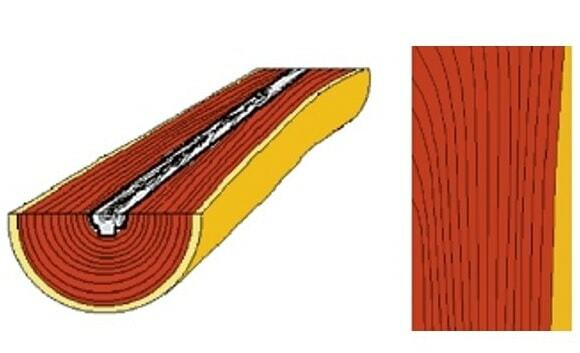 Flitches are a piece of wood/log sliced. It is the upper most layer of wood skin that is sliced which many call it as paper too. But paper here can be mistaken with writing paper. • Quarter cut veneers are obtained the same way as flat/plain slices veneers, the only difference is that the log is firstly cut into 4 quarters before slicing process. Quarter cut veneers are therefore narrower than flat cut veneer that are usually has straighter grains. Since the production with this style of cut is low, quarter cut veneers are quite costly. 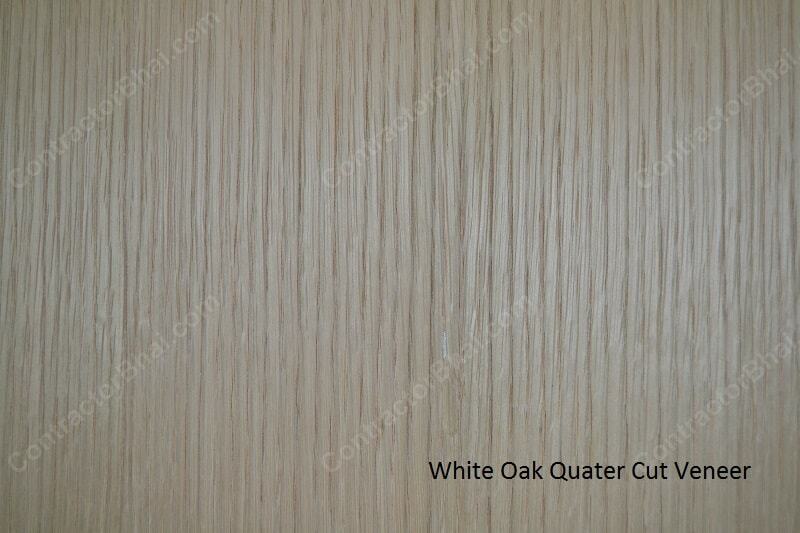 Quarter cut veneers are mostly obtained from logs of walnut, mahogany, oak and teak woods. • Rift cut veneers are obtained from mostly read and white oak. The rift effect or comb grain effect is obtained by slicing somewhat across the medullar ray. Rift cutting highlights the tight, very straight grains with slight angle (sometimes).Rift cut veneers are quite and expensive piece as the production from the log is quite low. But before the log is sliced, it is goes through few process to be finally cut. Only the finest log is sent for further cutting and slicing. If the woodcutter doesn’t think it’s the best, the log will not be sent ahead. Once the log of wood has arrived, it is soaked/thrown in pond of water for few days. 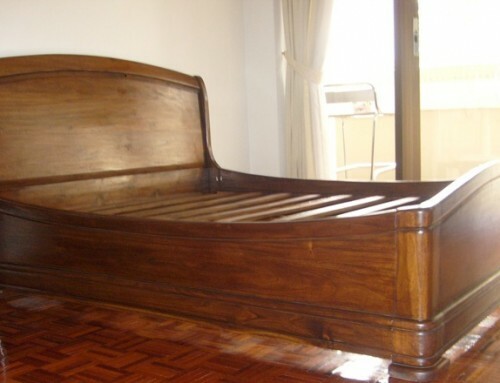 This is done make the wood stronger and avoid crack formation or breakage due to weather change, especially during summers. As and when required, the logs are taken out and kept for complete drying for few days. Once it is completely dried, the upper most layer or skin of log is scraped. The log is then scarped into a rectangular piece which is then cut at every 8th feet. Say if it’s a 32feet long log, then you get 4 pieces of 8 feet long log. But there’s always a margin of 3”-4” kept. This 8’ cut logs are then sent for slicing to veneers. The width of slices of log will vary with the size of log. It could vary from 5” to 6”, 8” to 1 feet. This sliced sheets is then sent for further process like stitching and taping and cutting. After cutting the sheet is then sent for drying where the moisture of slices sheet/leaf is absorbed completely. This sheet is then glued to the plywood. The glue is firstly spread on plywood with help of gluing machine. The sliced sheet is then pressed onto plywood in pressing machine. The plywood is then sent for final finishing and touch ups. The sliced veneer leaves are then sent to make big sheets of veneer. Veneer leaves cut in similar style or from same log are matched to form veneer sheets/ panels. There are various methods like Book match, Slip Match, Mismatch (random match). Matching within individual panel faces and between the panels is also one of the method to form creative and artistic veneer panels. Mismatched veneer sheet/panel is quite a trend these days. 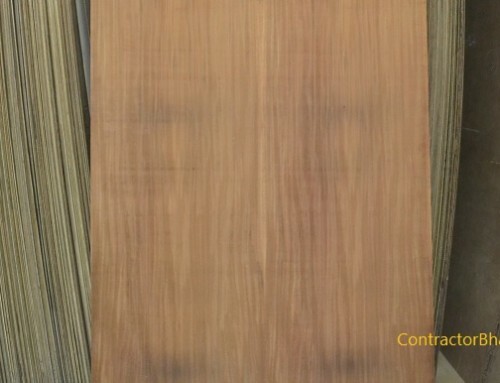 Here veneer cut in different style say flat cut n rotary cut are matched to form a veneer sheet. Deciding on which veneer panel is to be used where usually depends on professional (interior designer or carpenter or architect). But yes the first decision is of home owners to like or dislike the veneer design.